ColorFX, a family-owned business offers their services in printing solutions for more than 16 years from their 28,000 square feet bulding. Banners, catalogs, greeting cards, calendars, booklets, envelopes, brochures, presentation folders, newsletters, folding carton packaging, letterhead, CD DVD covers, sales sheets etc are some of the products offer by ColorFX. 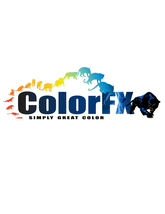 In addition, ColorFX has now started to provide graphic design services to the customers at a reasonable priced. These graphic designs are suitable for online printing. They use soy based ink or vegetable ink to produce eco-friendly products. Combination of advanced art equipment and digital technology facilitate them to maintain high quality. There are currently 1 consumer reviews about Colorfx available. Share your review. Company provides flexibility with ordering, that is, custom sizes and quantities are available even if not mentioned on the website. But, if you have a problem with the company, as we have, and they make offers to "fix" the issue you will probably need to take your issue higher up in the organization. Two years running the incorrectly folded a job, (10K + pieces) and made no offer to rectify the problem. I had to write a letter to get something (a credit against the next order). After offering the credit they then refused to honor their offer. Another letter is going out today. Product quality is fine but they (Sun Valley, CA) have no honor and are unethical in their business dealings - be careful. Please take a note that you are about to post a public review about Colorfx corporate office on CorporateOffice.com. This review will be public, so please do not post any of your personal information on this website. If you would like to contact the corporate offices of Colorfx, please use their contact information such as their phone number, website, and address listed above to contact them. However, sometimes staff from Colorfx headquarters do read the reviews on this website.